Plastics Recycling Charity RECOUP has announced a new seminar following a call from their members and the industry to address the knowledge gap of the plastics recycling value chain. The seminar, entitled Plastics 101, will provide delegates with the chance to learn more about the challenges of plastics recycling, including current legislation, the effect of proposed legislation, and an introduction to Extended Producer Responsibility and Deposit Return Schemes. This session is free and will take place on 25 September, a day before the organisation’s annual conference. The charity said that the session will help conference delegates who might be new to the sector or those who feel they would benefit from a better understanding of the industry, prior to the Conference. 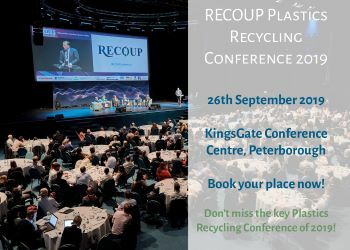 The RECOUP annual Plastics Recycling Conference will be held on 26 September 2019, and will cover topics such as chemical recycling, strategic direction, Deposit Return Schemes and more. Registration for the RECOUP Plastics Recycling Conference is now open: www.recoup.org/conference-2019.